The island of Crete lies in the eastern Mediterranean, to the south-east of Greece, about one-third of the way towards Egypt. To the north-east lies modern Turkey, and Cyprus is to the east, while Libya is directly to the south. Excavations have shown that Crete was inhabited from the Neolithic period (by 6000 BC and perhaps even earlier). 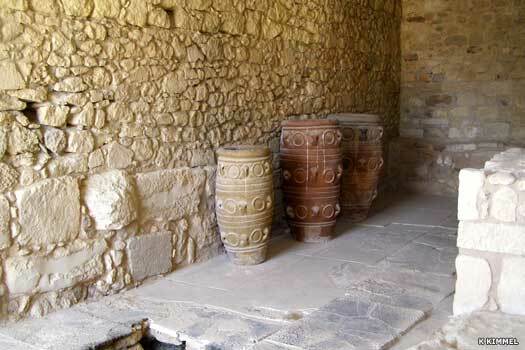 The Neolithic levels at Knossos (the Minoan capital) are amongst the deepest in Europe. An important construction already existed on this Neolithic site as early as 3000 BC. But, during this long era between 6000-3000 BC, the island seems to have been completely isolated from its neighbours, and, as can be seen from the pottery of the period, its culture was stagnant and monotonous. This period was characterised by a cultural change due, it seems, to the arrival on the island of new settlers who brought with them a knowledge of bronze-working. This was seemingly part of the general wave of migration of Indo-European peoples that also saw them arrive in Greece, later to dominate it. The Cretan arrivals seem to have migrated from Cilicia in Anatolia, and later legends maintain links between the two regions. Such a departure point makes it uncertain whether they were West Indo-Europeans like the Greeks or South Indo-European Luwian-speakers like the Arzawans and the Kizzuwatnans. Having assimilated the island's previous inhabitants, a true society emerged around 2200 BC, and with it a possible monarchy. What is not clear is whether 'Minos' was a name or the Minoan word for king. Scholars have noted the interesting similarity between Minos and the names of other ancient founder-kings, such as Menes of Egypt. However, the Minoan king was more like an administrator in charge of the trading activities of the state, while the real power in Minoan society lay in the hands of the priests. Thanks to this unique power structure, The Minoans did not display the same militaristic or political ambitions as their mainland Mediterranean neighbours, such as the Egypt of the New Kingdom. There were no grand statues depicting powerful kings, and women in society seemed to be highly prominent and liberal, even taking the role of powerful priestesses who organised a faith that saw one or more mother goddesses in command of the island's elemental forces. Cities had no defensive walls and although trade served as the chief economic engine, wealth tended to be evenly distributed. Minoan palaces may not even have been palaces, but perhaps business structures for the leading figures of the day to use as 'office space', or venues dedicated to the island's fertility, to be packed with offerings after a successful harvest. First queen of Crete in Greek mythology. Son of Neleus & Chloris in Greek mythology. Stepson. Good king Minos of Greek mythology. Asterion is the consort of Europa and stepfather of her sons by Zeus, according to Greek mythology. Upon his death the kingdom of Crete goes to Minos, who quarrels with his brothers, Rhadamanthus and Sarpedon, and promptly banishes them. Sarpedon seeks refuge with his uncle, King Cilix, in Cilicia. These stories probably remember later rulers on Crete who have the same names, but the stories surrounding them seem to place them much more early. It is possible that well known names have been used for more ancient stories, replacing the original participants. A pictographic script appears in Crete on seal stones. Most of the signs appear to be of local invention, although the significance of similarities between this script and those of Anatolia (including the Hatti) or even Sumer remains to be determined. By now the transition from Early Minoan, essentially a culture of subsistence village communities, to the beginning of the temple-palace tradition of the Middle Minoan period is almost complete. The first true Minoan palace was built some time around 1930 BC and was destroyed 300 years later, at the end of the Middle Period. Several other urban centres also had palaces of their own by about 1700 BC. The Minoans quickly became the luxury goods providers for the entire Middle East, producing the desirable rather than the strictly necessary, everything from exquisite pottery to fine leather boots - not to mention the highly sought-after and very expensive purple die that was farmed on Crete from murex molluscs, 12,000 of which were needed to provide enough die for a single garment. 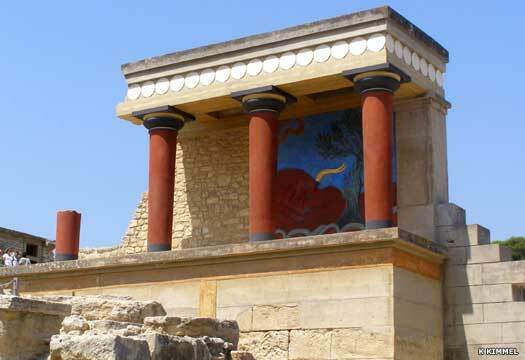 The Old Temple at Knossos is built around 1930 BC, while the first temple at Mallia is raised by about 1900 BC. The rural landscape is apparently run by rich landowners, evidenced by some buildings which are apparently houses also having their own storage facilities and tablet archives (at Mallia). A massive earthquake hits Crete, destroying much of the civilisation's infrastructure, including the royal palace. The Minoans were at their height in the seventeenth century BC. A new palace was built on the same site as that of about 2000 BC, a more elaborate version than the previous one, only to be severely damaged by an earthquake a hundred years later. Even so, it was rebuilt again, only bigger and better than before. This was Minoan Crete's golden age. Country villas specialised in high-quality vineyards, most notably at Vathypetro, and there were no fortifications, unlike on the mainland in Greece. Crete's only weakness was the frequent earthquakes which often destroyed what had been so lovingly created. This period saw the development of a series of satellite buildings such as the 'Little Palace', the 'Royal Villa', and the 'South House'. Knossos had developed into a large city whose population - judging by the adjacent cemeteries - must have been not less than 100,000 inhabitants. Minoan colonies were still in evidence, such as the one at Amyclae, a few miles south of the later Sparta. The disaster of circa 1470 BC again wiped out that good work. Son. Unified Crete, but possibly driven out by Minos. The middleman trading island of Thera (modern Santorini) is destroyed by intense volcanic activity and Crete is devastated by the resulting tidal wave and ash cloud, ending Minoan dominance of the Mycenaeans. Minoan society appears to collapse, not necessarily overnight, but a rapid decline sets in. New gods appear, these most markedly being male in place of the previously dominant female gods. 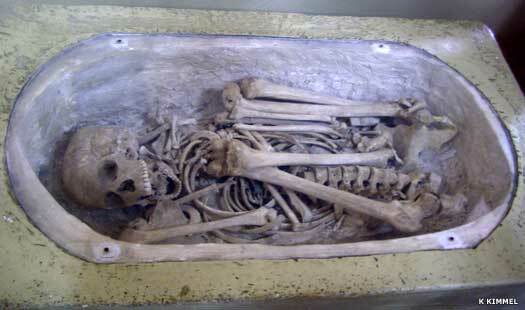 A find dated to this period of the remains of four children show that the bones have been scraped and cooked. Minoan civilisation may have collapsed to such a point that cannibalism is being practised. The island is weak and defenceless. There is further evidence from around the same point in time that Crete suffers the ravages of war, with several cities being deliberately burned down. This may be due to an uprising by followers of the old female gods, outraged at the new dominance of male gods, or it may be due to an invasion by the Mycenaeans, probably former vassals of the Minoans, who turn the tables and invade the island, reducing and conquering it. Either way, it is the Mycenaeans who take control of the island by the end of the century. The Mycenaeans, who had formerly been vassals of the Minoans, at least in Athens and possibly the Peloponesse, were now able to turn the tables and take control in Crete. Civilisation on the island had been almost destroyed by the aftermath of the Thera eruption, and there was probably not much of which to take control, but the Mycenaeans restored the royal palace once more, allowing it to be used by the Achaean sovereign until at least 1380 BC, although other city states in Crete had already been destroyed. 'Son of Minos', although this seems highly unlikely. As an ally of Mycenae, Crete supplies a contingent for the war against Troy. Ideomenus is one of the first rank of Greek generals and is among those to enter the Trojan horse. After Troy has been sacked and burned, Ideomenus returns to Crete. His ship runs into a storm on the way and he sacrifices his son to ensure safe passage for his crew. The gods are angered by this and his fellow Cretans drive him out of his kingdom, possibly led by Leucos, who is also credited with usurping the throne. Mycenaean power is gradually eroded in Greece following their success in the Trojan War. The collapse of the Hittites allows a Greek colonisation to begin of the western coast of Anatolia, and Crete probably serves as a similar bolt-hole for Mycenaean civilisation. However, even Crete is not immune from the general Dorian invasion of Greece, and all the city states on the island are eventually conquered. Leader of the Dorian invasion. Dorian colonies are traditionally governed by nobles of the Aeschaeoi, Aethaleis, and Echanoreis, but much of Cretan civilisation exists in a poorly recorded form during the first millennium BC. Crete never again experiences its own home-grown civilisation in the style of the Minoans. In 310 the island is conquered by Ptolemaic Egypt, but relinquished in 277 BC, to be governed internally until the arrival of the Roman republic in 67 BC.